Daimler and BASF have developed a new concept vehicle that combines both companies' ideas for holistic electric mobility. The resulting vehicle is the smart forvision, which has been developed with a special emphasis on energy efficiency, temperature management and lightweight design. 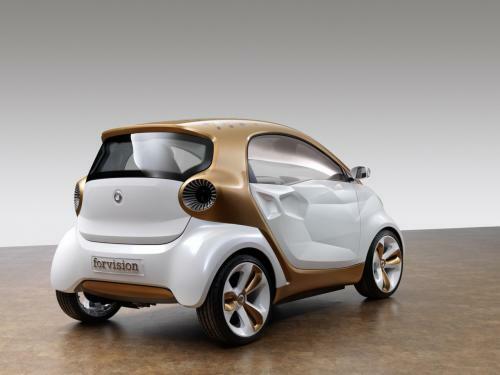 The smart forvision will have its world premiere at the 64th International Motor Show in Frankfurt. Both Daimler and BASF are engaged in wide-ranging research and development work aimed at getting electric cars on the road and ensuring that electric mobility becomes part of everyday life as soon as possible. Daimler is embracing the age of electric mobility: it is the first car manufacturer to have released four electric production models, and its smart fortwo electric drive is a pioneer among battery-driven vehicles. BASF, the world's largest supplier of chemical products to the automotive industry, develops sustainable, environmentally friendly solutions for the energy-efficient mobility of tomorrow. The two companies have now combined their technological competencies for the first time, developing a forward-looking vehicle concept that offers decisive solutions to the challenges of the future. The new vehicle brings design, lifestyle and technology together to form a new functional whole. "In this joint project with Daimler we have successfully developed a holistic approach to urban mobility of the future. This is something we are very proud of. Our research activities make an important contribution to ensuring that electric cars are affordable, environmentally friendly and sustainable," says Dr. Andreas Kreimeyer, member of the Board of Executive Directors and Research Executive Director of BASF SE. "The smart forvision is an impressive example of what can be achieved when two leading companies from two very different sectors sit down together. It was exciting to see how our developers and designers worked with the researchers at BASF and came up with a joint vehicle concept that provides a meaningful insight into the future of electric mobility," says Dr. Thomas Weber, Daimler AG board member responsible for Group Research and Development at Mercedes-Benz Cars. 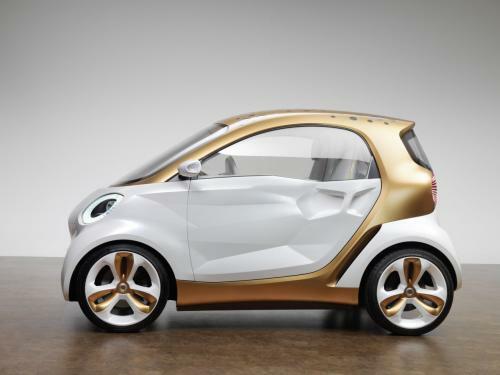 Because it has always set itself apart from other vehicle concepts, the smart was predestined for this joint project. 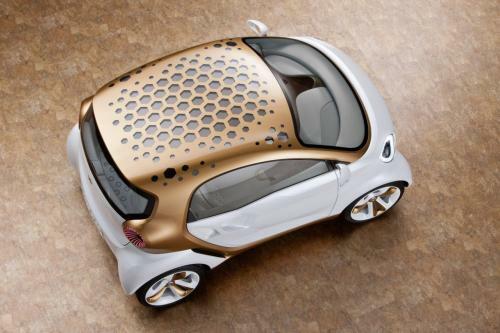 As a result, the smart forvision is the perfect vehicle for showcasing new technologies. The researchers and developers have succeeded in combining no less than five automotive world premieres in the new concept vehicle. Transparent organic solar cells, transparent organic light-emitting diodes, all-plastic wheels, new lightweight body components and infrared-reflective films and coatings all help to reduce the vehicle's energy consumption and thus increase its range and practicality. State-of-the-art materials and technologies allow new concepts to be implemented in the electric car that not only save energy, but even generate it. The resulting increase in range contributes to further improving the performance and economy of electric vehicles. The smart forvision features energy-efficient solutions such as power-generating solar cells based on organic-chemical dyes on the roof. Combined together with energy-saving organic light-emitting diodes (OLEDs), the vehicle's roof, which is covered in solar cells, is not just environmentally friendly, but a real design highlight as well. One challenge in ensuring the continuing development of electric mobility is sustainably producing and using the power required to drive the cars. Electric mobility is at its most effective in preventing climate change and protecting the environment when the energy required for it is generated highly efficiently and with minimal CO2 emissions. For this reason BASF is also working on solutions for producing electricity from renewable energies such as wind and solar power. The lighter an electric vehicle is, the less drive energy it requires, and the greater its range will be. Making vehicles lighter will therefore be one of the key challenges for electric mobility in the future, and BASF can make an important contribution here. Lightweight design means replacing heavy, metal components with composite plastic materials that offer the same functionality and stability. Weight can be reduced particularly successfully by substituting load-bearing components, for example the chassis, with fiber-reinforced plastics. Moreover, the smart forvision features the first ever all-plastic wheel suitable for series production, made from the new high-performance material Ultramid® Structure developed by BASF. This material, which is just as stable as metal, can reduce weight by up to 30 percent. The heating and air conditioning systems in vehicles are major consumers of energy. The amount of energy needed to heat up or cool down the vehicle's interior can be reduced with the help of a comprehensive temperature management system that uses innovative materials such as polymer films in the windows to reflect thermal radiation, and high-performance insulating materials. The smart forvision brings together these forward-looking technologies from the chemical industry with a unique mobility concept and distinctive design. Together, the automotive and chemical industries are making a significant contribution to the affordability, environmental friendliness and safety of electric vehicles. In the smart forvision, Daimler and BASF have laid the perfect foundations for efficient, sustainable, uncompromising electric mobility.